(23139.G24, John Dunning Political Collection, OHS). 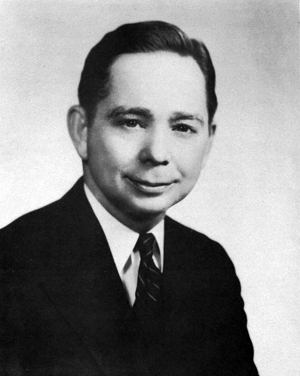 From 1971 to 1976 Carl Albert served as Speaker of the U.S. House of Representatives, the highest elected public office held by an Oklahoman. On May 10, 1908, Albert was born at the Bolen-Darnell mining camp near McAlester to Ernest Homer and Leona Ann Scott Albert. He was the oldest of five children. A few years later the family moved to a farm near Bugtussle (also called Flowery Mound), and Albert attended primary school. In 1923 he enrolled at McAlester High School, his worn overalls belying a sharp mind and strong determination. He excelled in school. When he graduated in 1927 he was student body president, valedictorian, and the Midwest Oratorical Contest winner, for which he won a three-month European tour. His classmates nicknamed him "Little Giant" in reference to his accomplishments and to his small physical stature. Arriving with ten dollars, Albert entered the University of Oklahoma (OU) in fall 1927. He paid for his education with odd jobs the first year, but then he won another oration contest that awarded him a trip to Hawaii, fifteen hundred dollars, and several invitations to speak to civic groups. One such offer came from Thomas Pryor Gore, who needed a driver and an introductory speaker on his Oklahoma campaign stump. It was Albert's first real political experience. Excelling in college, he was a member of Kappa Alpha fraternity, Reserve Officers' Training Corps, and the debate team. Other honors included student council president, Dads' Day Cup for outstanding male student, and a Phi Beta Kappa key. After graduating from OU with a bachelor's degree in government, in 1931 Albert received a Rhodes scholarship and left for England. At Oxford he studied law for three years and journeyed throughout Europe, North Africa, and the Middle East, pursuing his interests in travel and foreign languages. With two law degrees, Albert returned to the United States in 1934. The nation was deep in the Great Depression, and work was scarce. His first job was as a legal clerk for the Federal Housing Administration in Oklahoma City. Then followed several years of legal work in the oil industry in Oklahoma and Illinois. The early days of World War II forced Albert to trade his legal practice for the U.S. Army. He was drafted in 1941 and trained with an artillery battalion of the Third Army at Camp Polk, Louisiana. When Congress amended the Selective Service Act, he was released after only a few months due to his age. He had applied for an officer's commission and accepted assignment to the judge advocate general's (JAG) office of the U.S. Army Air Corps. He first worked in Washington, D.C., and there he met and fell in love with Mary Harmon, a secretary in his office. They were married on August 20, 1942, before Albert was transferred to the Pacific Theater to serve in Gen. Douglas MacArthur's overseas JAG office. Albert returned to the United States in 1946 as a lieutenant colonel. After the war the Alberts moved to McAlester. He sensed the time was right to pursue his lifelong dream of running for Congress. The 1946 Democratic primary in Oklahoma's Third District was an eight-way race, and after months of speeches and campaigning under the slogan "From a Cabin in the Cotton to Congress," he squeaked by his opponents to win the primary by a margin of 330 votes. As the Third District is nicknamed "Little Dixie" for its consistent support of Democrats, Albert handily beat his Republican challenger. It was the hardest race he would ever run. As a freshman member of the Eightieth Congress Albert was assigned to the House Committee on the Post Office and Civil Service. While certainly not glamorous, the committee did not take up much of his time, leaving him free to study the workings of Congress and its members. His diligence caught the attention of House Speaker Sam Rayburn, who often invited Albert to informal discussions in his office. On Rayburn's advice Albert accepted a new assignment to the Committee on Agriculture in 1949. In this post he was well situated to address the needs of his district. Some of his early legislative efforts benefited Oklahoma peanut farmers and improved flood control in the Red and Arkansas river basins. Albert's years of careful study paid off in 1955. A shuffling of committee chairmanships left vacant the post of party whip, and Albert was appointed. The main challenge of the time was a seniority system for committee chairmanships that guaranteed a near monopoly for Southern Democrats and an autonomous Rules Committee that often held up important legislation. When Sam Rayburn died in office in late 1961, in 1962 John McCormack became Speaker, and Albert ascended to majority leader. He became Speaker in 1971 when McCormack retired after tumultuous tenure that had weathered clashes over education, civil rights, welfare programs, and Vietnam. As Speaker, Albert focused on congressional reform through committee structure, the appropriations process, and a renewed Democratic Caucus. However, inflation, recession, Pres. Richard Nixon's frequent impound of appropriations, and the ever-worsening conflict in Vietnam threatened the unity of the House. Perhaps Albert's greatest challenge was presiding over Congress during the Watergate scandal. He chose not to involve the House in investigations of Vice President Spiro Agnew and referred presidential impeachment resolutions to the House Judiciary Committee. Twice during the scandal Albert was second in succession to the presidency. As Gerald Ford and Nelson Rockefeller were both appointed by Congress, Albert was the highest-ranked elected official serving during their administration. During his congressional tenure the Alberts had two children, Mary Francis, born in 1948, and David Ernest, born in 1954. After three terms as Speaker and thirty years in Congress, Carl Albert retired in 1976. He and Mary returned to McAlester. He kept an office there and continued to be active in politics and public service until his death on February 4, 2000. Carl Albert with Danney Goble, Little Giant: The Life and Times of Speaker Carl Albert (Norman: University of Oklahoma Press, 1990). Carl Albert Collection, Congressional Archives, Carl Albert Congressional Research and Studies Center, University of Oklahoma, Norman. A. Heath Anderson, "A Reluctant Heir: Carl Albert, Watergate, and the American Presidency," The Chronicles of Oklahoma 85 (Fall 2007). Erin M. Sloan, "Albert, Carl Bert," The Encyclopedia of Oklahoma History and Culture, https://www.okhistory.org/publications/enc/entry.php?entry=AL003.